November, the season of mists and mellow fruitfulness. A time for remembering – for celebrating saints, for begging God’s mercy for sinners, for refusing to forget all those whose lives were cut short by war… so how do we cope when already the shops are decked with holly and Christmassy tra-la-la-la-las assault the ears of unsuspecting curates out looking for a copy of Fauré’s Requiem? At first, as I was trying to prepare for our All Souls’ Day service, this November 2nd – hopefully to be a great occasion with quiet to remember, hope to share, music to rejoice in and the Bishop to lead us! – I began to get quite angry with the ever earlier start of the shops’ commercial cashing in on the greatest free gift of all time. But then I had one of those moments where I was challenged by Theological Consistency – she’s a hard task-mistress, I warn you! The problem is I believe in a God who speaks at all times and in all places, so if I’m theologically consistent, there should be a message from God even in this most unpromising of moments. So I decided to do a spot of listening while doing the washing up (a good time for theological reflection and underrated in the mystical literature). And what I think I heard was actually a challenge, a challenge to hospitality. It’s all too easy to keep All Souls’ Day very separate from Christmas. We might let a little bit of Easter into Remembrance, the odd bit of hope, heaven and resurrection, but the Christmas story we keep in its place. However, if we let the Christmas message float from tinny shop stereos through our ears and into our hearts in November, I think we might begin to see both the season of remembrance and Christmas itself quite differently. There’s something about time – the one month speaks of humanity’s prayer to be released from time into eternity, the other of God’s descent from eternity into time. There’s also something about what remembering the dead should mean for our attitude to the living, in the light of God’s great gift and the story of that unwanted family sheltering in a cave. We need to bring people not just an Easter hope for the future but a Christmas hope for the present (sorry, couldn’t resist the pun!!). The Christmas angels we look for so excitedly amidst the nativity scenes and carols are actually, Hebrews tells us, to be found on our doorsteps and in our homes – “Do not neglect to show hospitality to strangers, for by doing so, some have entertained angels unawares” (Heb. 13.2). As we pray for the departed, as we give thanks for a world that many died that we might enjoy, should we not be visiting one another more? Should we not be opening our hearts and our homes now in the name of the babe of Bethlehem to those we pray we will be joined with forever in the kingdom of heaven? I believe in a God who speaks – sometimes even in W.H.Smith’s – what’s he saying to you? 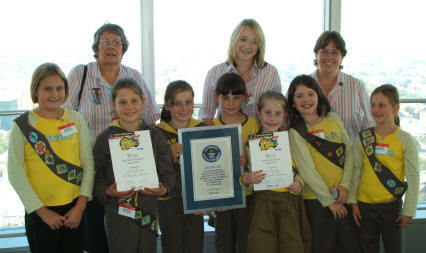 The 36th Cheltenham (St Nicolas’) Brownies took part in the BT ‘Giant Sleepover’ in June – and, out of 1,000 sleepovers held nationwide, we won TWO BT awards! 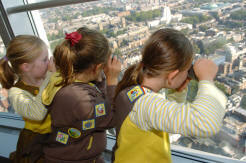 So on 10 October, three Guiders and seven Brownies travelled to London to collect our awards on the 34th floor of the BT Tower (which is not open to the public). We were presented with our certificates for the best website – www.36cheltenhambrownies.ik.org (why not take a look and leave the Brownies a message in the guest book?) – and also for the best overall sleepover. We are now awaiting the delivery of our prizes – a DVD player, and a digital camera! We were treated to a buffet lunch while the revolving floor was turned on and, when we were ready to go, we were all given a special certificate to show that we had been in the BT Tower! Six weeks into the project at St Mary’s CE Infant School, I am amazed how many children rush up to one of the group and say “You’re the Open the Book lady/man”, or make a point of introducing us to their Mum or Dad. The children seem to enjoy the structure of Open the Book. The service always starts with an introduction and the team opening the Storyteller Bible. The children also put their hands together and open their own imaginary book with us. We try to involve some children in the story each week, and when it’s appropriate we get everyone to join in some actions or mimes. The story is narrated by one member of the team and then acted out by the rest of the team with some children. The team makes time each week to rehearse the story and try out our ideas; this usually takes about half an hour. After the story we spend a few minutes reflecting on the key point of the story or something the children can picture, for example a rainbow. The final part of the service is a short prayer, when the children are invited to say ‘Amen’ to make it their own prayer. The children who have been involved in the story are given a sticker to thank them for taking part. We currently have a team of nine people, but if you are reading this article and feeling called to be involved we would love to hear from you. Just speak to Marion Beagley, Mary Turner, Sheila Beer or give Julie Jefferies a call on Cheltenham 232892. People have obviously heard that I have been granted Sabbatical Leave but there is much misunderstanding about what that is and when it will happen, so here it is ‘from the horse’s mouth’! Sabbatical Leave is described in a Diocesan pamphlet as ‘a structured and well planned opportunity to step aside from the everyday routines of active ministry’. It is granted, at the discretion of the Bishop, to clergy who have been ordained for at least ten years and is to be seen ‘as part of the conscious development of ministry’, and therefore of enormous benefit to that ministry. It is an opportunity for rest and reflection. A time to stand apart slightly and to concentrate on something particular that there would not be time for within the normal constraints of parish ministry. Bishop Michael has granted me three months’ Sabbatical Leave in 2006. This will commence on Monday, 17 April and include my annual leave, which means that I will return to parish ministry on Sunday, 13 August. During the Sabbatical I will be taking the opportunity to experience different Spiritual Traditions as well as undertaking one or two retreats and short courses. I hope that this will be of benefit to my work as a Spiritual Director and as a trainer of potential Spiritual Directors. I also believe that this opportunity will richly enhance my parish ministry as well as my own journey of faith. At the conclusion of the Sabbatical I will have to prepare a short report for the Bishop. Lots of things need to be in place before April. I will be absent from the parishes for the whole period and so all my usual responsibilities will need to be covered by others. Also there are lots of implications for our family as I will be away from home for differing periods of time. At this stage I cannot quite believe that it is going to happen, even though things are beginning to be booked! Please pray for me as I prepare and for those who will cover things whilst I am away. Do ask me if you would like to know more about what I will be doing! Once again during Advent we are proposing to send our crib figures of the Holy Family on pilgrimage throughout the Parish to the homes of our congregations - Journey with Jesus. This year, two sets of crib figures will be journeying, leaving St Mary’s and St Nicolas’ on Advent Sunday to spend two or three nights with a family before being delivered to the next ‘hosts’. The figures will be returned to the Churches on Christmas Eve. We are not expecting them to just stay with families with children; this is open to all members of the congregations, and we hope the figures will present an opportunity for the ‘hosts’ to offer hospitality to others at this time. This was an extremely popular activity last year and anyone is welcome to take part. If you are interested in participating in this act of pilgrimage then please speak to Fr Grant or Linda. There’s always a lot in the papers about respect, well usually lack of respect. Often it is ‘youth’ who are labelled (unfairly?) as the ones who do not show respect. As Christians we know that respect and lack of it is not an age issue. At the heart it is an issue of the heart – it is about knowing the One who is the source of all true respect. The Maker of All, who gave us the precious gift of free will and the chance to make broken lives whole again, is the only firm ground on which to build self-respect. It does not stop there, though. Godly self-respect must become respect for others, however different they may seem, and for the planet – as all share the same Creator and Rescuer. This vital message of respect is one that will be shared with young people across Cheltenham and the UK as part of a Youth For Christ initiative during the week of 21-25 November. For young people across Cheltenham it will lead to an all-nighter at St Nicolas’ on Friday, 25 November. The night promises activities, sport, prayer and worship as well as a struggle to stay awake. Please pray that it will be a great night, but also that the good news of respect would continue to spread. Who can you share the message of respect with? 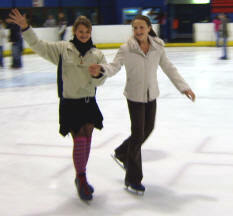 On Friday, 14 October a group of 30 young people and leaders from Elevate, the Space and Synergy went to Oxford ice-rink. It was a great evening of having a go, laughter, and getting to know people from different groups. Things got increasingly difficult as the lights turned to disco mode and the ice became more rutted (and wetter!!). There were of course a few bruises and wet pairs of trousers. The thing which really stood out though, was the way everyone helped each other - no one was made to feel a fool for their lack of ice-skating prowess! Thanks to all for giving it a go and especially to the volunteers for making it happen. On Sunday, 9 October ‘Celebrate!’ was one year old. We ‘celebrated’ our birthday in true party style at the 9.30am service with balloons, party poppers, a party game and pass the parcel (with a difference): between each wrapper was a text from the Bible which reminded us of God’s Great Love for all his people shown through the giving of his son, Jesus Christ, who suffered death on a cross to redeem the world. Through our prayers and songs we also offered thanks and praise to God for his constant love and support. The congregation had been asked in previous weeks to let us know any favourite songs they would like included in our birthday service. Everyone joined in with great enthusiasm, instrument playing and flag waving and, as usual, our music group did us proud, both with their general accompaniment and their individual contributions. "Celebrate! - feeling of belonging: great for all ages to be together as family of God; very child friendly; great worship group; kind of service you could ask friends to come to without embarrassment." "Celebrate! has been, and is, a lovely service to bring my young family to. It has been a friendly way to introduce them to Christianity." "It is so friendly and welcoming and we really feel part of God's family." "We so enjoy the Celebrate! service and it is a joy to bring the children. My son looks forward to a Sunday morning and learning the Christian way in a relaxed atmosphere." “The Team is made up of representatives from all ages – they are kind, caring and enthusiastic and really work well together and so obviously want to share their Christian faith with everyone. “I have found it a good place to bring my daughter to learn about Christianity, particularly in conjunction with ‘Rockers’ which is also held in St Mary’s Church on Thursday afternoons at 2pm”. (This is for pre-school children and their parents/carers – anyone is welcome to come along). “I like to come with my family – it feels comfortable and unpressured – it is helping me to rebuild my faith. “It is held at a good time and, from a child’s point of view, is not too long and is easy to follow”. A final quote taken from an e-mail sent to the ‘Celebrate!’ Team by Fr Michael: “It’s amazing to realise that we’ve done a whole year. It’s been a tremendous journey and really great to have reached so many”. And he holds us in his hands”. On the morning of Saturday, 1 October, a peal of Double Norwich Court Bob Major was rung at St Mary’s. This consisted of 5088 changes which took 2 hours 50 minutes. Three of the band were regular Prestbury ringers. The other five ringers were from other Cheltenham churches. We have recently had some electrical work done in the tower to provide additional power sockets for maintenance work on the bells. The ringers paid for this out of our own tower funds. We rang for the funeral of Jill Yates on Friday, 7 October. Her family had requested the bells, so we made special arrangements: ringers stayed behind after the Tuesday practice to put the muffles onto the clappers. Several ringers took time off work to help form a band on the day. We were able to ring all eight bells half-muffled before the service and a bell was tolled (again half-muffled) after the service during the burial. Two of our ringers who learned to ring for the Millennium - Owen and Joan Barraclough - recently gave a talk to 100 people at the Ringing World Roadshow which was held at Newbury Racecourse. Their theme was “We wish we’d started to ring forty years ago”. Apparently the discussion afterwards was lively and well received. Janet Covey-Crump, our former Tower Captain, who is now Ringing Master of the Cheltenham Branch, was among the instructors on a ringing course held over three days at Wantage. Our best wishes go to Adam Vellender, one of our younger ringers, who has recently started a Math degree course at the University of Wales, Aberystwyth. He has joined the University Guild of Ringers and is enjoying ringing the bells at Llanbadarn Fawr. Saturday, 12 November at 7pm in St Mary's Church Hall (now called Prestbury Hall) in Bouncers Lane. Come and test your knowledge (or just watch) - the cost is £2 per head and teams can be of four or five people. There will be a bar and cash prizes to the winners! Michael Brick will be the question master and we look forward to an evening of fun and learning! Please join us. - during the 09:30 Eucharist at St Nicolas'. The next bakestall will be on Sunday, 20 November, when we hope to receive contributions from members with surnames beginning G-M. There will not be a bakestall in December, but will all members please give to a ‘bumper’ stall on 15 January. Many thanks. If you would like to join any of our baking teams, do please contact one of us. Our next meeting is on Tuesday, 22 November at St Nicolas’ starting at 7.30pm. An evening of Christmas Crafts with Dee and Marion. All are welcome. See in 2006 & have fun! We are a small group of mums with pre-school children who meet on a Thursday afternoon from 2pm to 2.45pm at St Mary’s Church. If you are a pianist or guitarist, and can spare 45 minutes (once a month or more) to play for us while we sing, please call Vicky Dunn on 580849.